Sleeping Trees and Pumpkin Spiced Lattes–Is it Fall Yet? It’s a relatively cool morning for August in Texas. Trees in abundant green, and in full bloom surround me. Beautiful by any sane persons measure, but all I can do is look at them and wait for them to die. Or at least take the slow march to slumber. Fall. I want fall to be here like, yesterday. Selfish really as this has been the kindest summer Texas has given us in recent memory. Or any memory for that matter. But Fall is my jam! Fall is my season and it begins (in my mind) on my birthday, which is on the exiting side of September. Or whenever I order my first Pumpkin Spiced Latte from Starbucks. I’m not terribly fond of my birthday, there is some infighting between myself and my birthday. A disagreement. The more I seem to have, the greater the disparity between what the calendar tells me I am and what I feel I am. Still. On my birthday people give me things, and the finest kind take me out for tacos and I let them. So once the celebration of my Vaginal Escape Day ends, the fun begins, because what my birthday really means is Fall is right around the corner. A few weeks after my birthday, comes October and this signifies that I am now at the doorstep of Fall, and Pumpkin Spice Lattes are flowing. October will wane and I will find myself at my favorite Holiday-Halloween, Though Halloween and Christmas often tussle for the prize of being favorite, But that’s my point. As soon as I get past my birthday, good things happen. Cooler weather is upon us, I can swap out my sandals and shorts for my boots and jeans. I always feel better when I wear my boots. I don’t know why. It’s funny really, as most of my youth I rebelled against anything that was stereotypically Texas. Now it takes 90 degree days to get me out of them, and that’s only because I can’t rock the whole boots and shorts thing. Also I am a hoodie guy. Fall is my hoodie time. They are like walking Woobies. Jeans, boots and hoodies are my fall uniform and I can’t wait to get into it. It’s also family time. Thanksgiving is a few weeks of X’s on the calendar and I find myself across the table from people I love, but see far less than I would like to. It’s extra special for me as it also marks when my Lady Love and I got together. Thankful in deed I am. Jingle Bells and here comes Christmas. If you know me you would know that I am not overly fluffy. I have missed more Disney films, than I have seen and I’m fine with that. So, while I wouldn’t call myself Angsty or Stabby, the only “bright ball of light” in my world is the sun. Which as a pasty white boy, I loathe. So it might surprise you that I am a dues paying, card carrying member of the Christmas Whore Club. I love everything about Christmas, even the corny stuff that you wouldn’t think would appeal to me. Right now my mind is on gourds, Halloween and the cool embrace of Fall. I am looking so forward to Halloween I can’t stand it, but I have to. 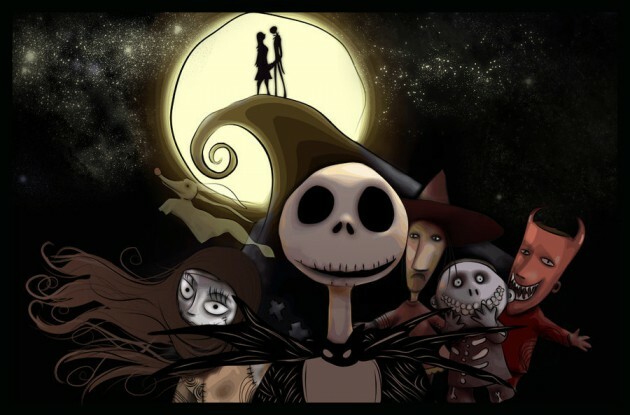 The Nightmare Before Christmas, one of my all time favorite films, as it celebrates both Halloween and Christmas, is usually my official Fall kick off. I saw it the other day on Netflix calling me like a lover hopped up on Oysters and chocolate. I will wait though, just a couple of more months Jack. I think I’ll go pluck a leaf and see if I can get this party started.